Interviews with bikeriders from taped interviews. Numerous black and white illustrations. 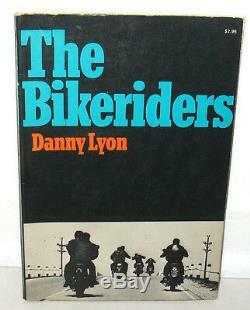 SIGNED by Danny Lyon on the half title page. In the niche of photo documentary that takes as its subject American subcultures. Lyon photographed communities from the inside, making them an integral part of his life for the duration of the project... [it] represented a significant step in 1960s American photography, not only launching an important photographic career, but also giving a younger generation of photographers a spokesman... Understanding instinctively not only their hopes and aspirations, but also why they were rebelling against all kinds of adult authority. Wear to the edges and to the head and heel of the spine. Small right angle crease and peel to back cover lower left hand corner. Soil spots to the fore edges. Internally, scattered light foxing to inside covers, to the half title page, and to a couple of pages of text. Tiny and light semi-circular stain to the bottom edge of pages 83 to 94. Small light triangle shaped stain to the rear inside back cover. Glue from the binding visible along the back cover. Very scarce SIGNED copy of the original edition. Danny Lyon is a writer and photographer whose photos of prison life, the Southern civil rights movement, and American Indian nations are legendary. He lives in the Hudson Valley. 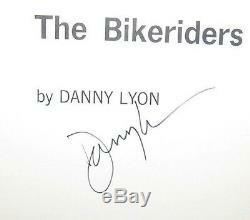 The item "SIGNED Danny Lyon The Bikeriders Original 1968 1st PB Motorcycles Bikes" is in sale since Friday, November 4, 2011. This item is in the category "Books\Antiquarian & Collectible".